The Orchid Breeze Apartment at Villa Delfin: Stay in our amazing 1000ft2 one bedroom condo (King sized bed), with twin sofa bed in living room. The apartment has granite counter tops, beautifully tiled bathroom and floors, minutes to the beach, part of a fabulous spanish colonial villa that is nestled up on the hill in the jungle so that you have all the privacy you want, and then when you want to get into the restaurant and bar life, it is a 5 minute car ride away! With the private ocean view deck, you can put your feet up and relax with your favorite drink close by. Keywords: A 1000 ft2 condo with full one bedroom with King sized bed plus sofa bed in living room to sleep 4. Extra bedroom available with King Sized Bed. Huge vaulted ceilings, balcony with comfortable patio furniture and with ocean/jungle views, Amazing pool with view of jungle and ocean, living room with comfortable couches and dining area. Fully equipped kitchen. Close to beach. Solar backup power. I finished construction on the villa in 2008 and am now managing it with my husband. I am also one of the musicians on the island! Fabulous diving, warm clear water, beautiful surroundings! The villa is an eco villa, powered by solar power and thus, when the island's power goes out, we still have our lights, fridges, fans, etc all running! We have, a beautiful pool with jungle and ocean views and are a 15 minute walk along the beach to West Bay restaurants and bars. Bathroom has large tiled shower. Air conditioning in bedrooms, extra charges apply: $10/night per bedroom. Fully equipped kitchen with gas stove, fridge, microwave and everything else you would need for cooking your meals! tv with dvd player. We do not have cablevision. We have a great video library! 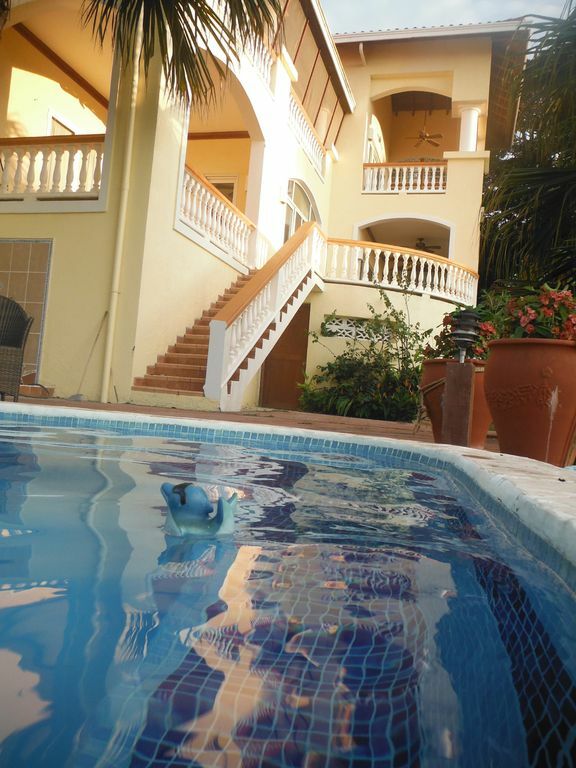 The pool overlooks the jungle and ocean and is shared by other condos in the villa. The island of Roatan is known for its fabulous diving. It also offers horseback riding, snorkelling, fishing and some of the whitest beach in the Caribbean. There are lots of great restaurants and live music. A very entertaining island but without all the over development that most other islands have. You won't see a single high rise, big chain restaurant or store. You won't even see a stop light! It's very enchanting!